BERLINALE SHORTS: INTERVIEW WITH MICHALINA MUSIELAK ON HER FILM "MISS HOLOCAUST"
One of the films representing Polish cinema at the 67th Berlin International Film Festival is the short documentary film by Michalina Musielak, "Miss Holocaust." The film will compete for the Golden and Silver Bear in the competition section Berlinale Shorts. We would like to invite you to read the interview with the film's author. "NOTHING EXEMPTS US FROM THE DUTY OF CONSTANTLY ASKING THE QUESTIONS, HOW TO REMEMBER AND WHAT TO DO WITH THIS MEMORY?" - INTERVIEW WITH MICHALINA MUSIELAK, THE AUTHOR OF THE FILM "MISS HOLOCAUST"
Daniel Stopa: The Beauty Contest for the Holocaust Survivors is the subject matter which would make major news headlines, which arouses controversy, and has its supporters and opponents. When did you come to the conclusion that this subject matter hides something more than just media news? Michalina Musielak: Immediately I thought that this is the subject matter which I am interested in, and which, thanks to my experiences in life, I can depict in my own way, differently than mere media news. I do not like beauty contests, but this one, due to its specific character, aroused my interest. I wanted to learn more about it. Yes, during my studies at Tel Aviv University, throughout the entire semester of the classes with Rachel Perry, Ph.D., I was concerned about the representation of "Shoah" in the contemporary culture. A beauty contest seemed to me a particularly interesting idea to answer the question, how should we remember? Though it seems to me that nothing exempts us from the duty of constantly asking the questions, how to remember and what to do with this memory? We try to remember the message to the world, which the protagonists attempt to pass during the event. There is the question, does anyone take them into account during the contest? The message to the world is always present at beauty contests and there was no lack of it here. It amuses me when it suddenly turns out that at typical beauty contests, where the women are selected because of their figures and the size of their breasts, according to the organisers, the participants become the authorities on peace in the world and have to deliver a message to the world. Here, this concept becomes surprisingly much more justified. But are we sure about it? I wanted to ask about the relationship with the protagonists of the film. Was your team identified with the organisers of the contest? Was the documentation held also outside of the contest and the preparatory stage? It was not easy to get the permission to film, the organisers let us in as the first team from the outside. Though we were not really from the outside. Long before the first shot, together with the friend Hanna Ferenc Hilsden, who was present from the very beginning of the development of the project, we were trying to reach this community, to understand it and to obtain the permit. It took us two years. 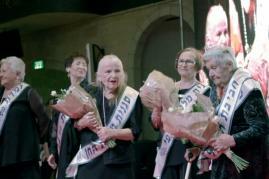 The whole team of "Miss Holocaust" consists of young Polish women, so there was no possibility of identifying us with the organisers of the contest. It was very easy for us to step into the shoes of granddaughters, who are fed cakes and given sweets. The girls were laughing that I fed the team only with sweets. It was not possible to leave without eating the cake, served by each of the ladies, and later there was no place for anything else. 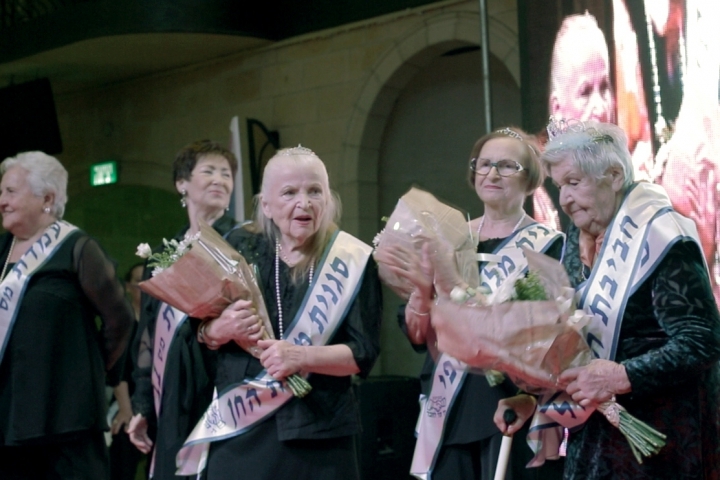 You have to remember that these are mainly the ladies from Eastern Europe, jokingly called in Hebrew "Ima Polanija," in literal sense, "Polish mother." A stereotype which had its sister definition in "Jidisze Mame." They have more in common with our grandmothers than anyone might have thought. The city, in which the contest is held - Haifa - plays an important role in the film. Why was portraying the city so essential for you? Haifa is my favourite city, though from the point of view of the young, it is not attractive enough. It has only one hipster street - Masada, where all the pubs and cafes are located. Surprisingly, the street is next street to the Warm Home for the Holocaust Survivors "Yad Ezer," which was the co-organiser of the beauty contest for the Holocaust Survivors. Haifa is associated rather with family and peace. For me, it was essential to show its unique character: it is a port city, one of the most important agglomerations in the history of the State of Israel. Here, the pioneers and builders of the state came by ship. Here, among the greenery and the hills, they decided to settle down. My intention was to pass on, thanks to long shots, also the emotional layer. Long shots, showing nature, give distance to the world, in this case, the world of our protagonists, the shots focusing on nature emphasise its cyclical character. The portrait of the desert, which opens the film and which is also included on the poster, is the canyon, one of the tourist attractions, though for my friends who live there, this view is good for morning tea. Here again: for me, the desert is filled with emotions, carries the symbolism of the pioneers, the new identity of Israel and "Sabra" who were born there, but it is also the image showing emptiness. "Miss Holocaust" is a Polish-German co-production, the project was also developed within the frames of the workshops Doc Lab Poland. How did the participation of the international co-producer and taking part in the workshops influence the production and promotion of the film? The film "Miss Holocaust" is a co-production for one simple reason - in spite of a very modest budget, we could not find financing in Poland. Fortunately, our idea gained recognition of the German producers from Juno film, whom we would like to give our thanks once again. The workshops Doc Lab Poland were very important in the film-making process. The comments which we received from the tutors and other participants helped us to take decisions regarding the presentation of the subject matter, the format, and even the title. During the May pitching in Krakow, we presented "Miss Holocaust" to a wider public for the first time. In the audience, there were many representatives of film festivals, who constantly kept in touch with us and from whom we started to receive invitations.